If you’re running out of ideas in terms of cool Christmas stockings, you should know that there are actually loads of new and creative designs to choose from. Whether you want to buy a set of stockings with the usual Christmas motifs or want to go for a design featuring your favorite movie character, options abound. You get to personalize the stockings this year and ensure that the people receiving them will just love them and be eager to see them filled with stuffers soon. If you’re searching for the perfect gifts this Christmas season, why don’t you get the Wewill Christmas Character package? 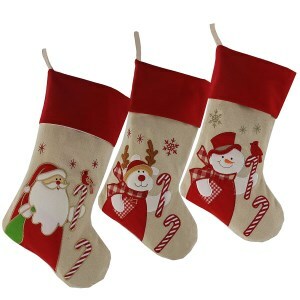 You get three lovely stockings featuring Santa Claus, a reindeer, and a Snowman to delight your loved ones. These stockings are made of soft and warm felt that will delight and impress. You can hang these by the fireplace and wait for Santa to fill these, as they will certainly be able to hold a lot of stuffers thanks to their large 17-inch size. The cheerful characters will certainly bring joy and put a smile on everyone’s face and get people closer together this Christmas. This Glitzhome Christmas stocking comes with a creative design and durable materials. This item is made of high-quality acrylic fibers and polyester for a soft touch and a pleasant feel. These materials are also quite strong, so you can bet they’ll be able to hold lots of gifts so Santa can positively be more generous this year. 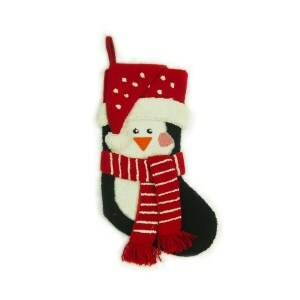 The handmade penguin features 3D shapes, with a Santa hat and a scarf that are made of soft felt. The colors are vibrant, and the character is funny, making these stockings perfect presents this season. This model also comes with a convenient hook to hang the stocking in the Christmas tree or above the fireplace. 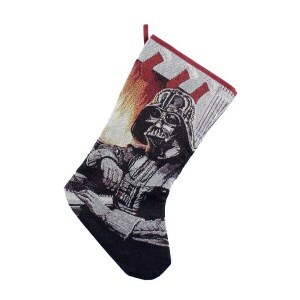 You don’t have to be a Star Wars fan to get this high-quality stocking from Kurt Adler. Chances are that whoever is going to receive it is surely going to know who Darth Vader is. While not exactly the most common holiday motif, this character will certainly impress or even amuse the person receiving it, especially when you can always say the killer line, “Luke, I am your father!”. The size of this sock is just as scary as its character, as you can bet 19 inches’ worth of stocking is going to give you a hard time trying to fill it with goodies. 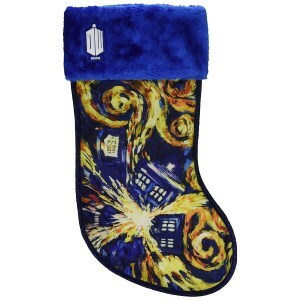 Whether you know someone who’s a Doctor Who fan or you just love the creative design, getting the Tardis stocking made by Kurt Adler is a fine choice. Made from durable polyester, this item is strong and resistant, and its 19-inch size allows it to fit inside lots of good stuffers. The stocking features Doctor Who’s time machine, the Tardis, which just happens to look like a police phone box. You get to delight with the Starry Night motif and add a stylish decor to your home while also getting someone eager to find out what Santa is going to bring this season. This Christmas season, you can ‘get the boot’ without losing your job, with the Kurt Adler U.S. Army Combat Boot stocking. You can get this military replica and give it to someone who expects to get some serious presents this year, no joke about it. 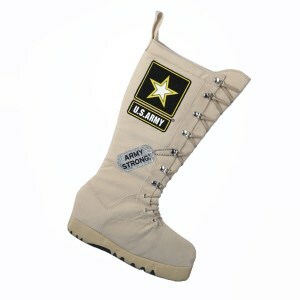 With this model, you get a large 19-inch stocking with real string lace details and a dog tag accent. Just like the real thing, this item is made to last for a long time. This product is ideal to offer to a U.S. Army Soldier or a military family member. If you’re one of the more traditional people and want to get a stocking that comes with the usual season colors and motifs, then the Worth Imports Christmas Sock is, without a doubt, a good choice. 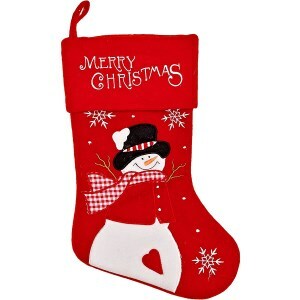 This high-quality stocking features the beloved Snowman that children adore, as well as a vibrant red color that will surely match any decor you have in the home at this time of the year. This sock is made of 100 percent polyester that’s soft yet durable. The fine embroidery with the adorable snowman design will help everyone get into the Christmas spirit and enjoy a happy holiday in the presence of loved ones. 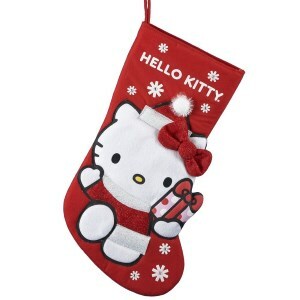 The Kurt Adler Hello Kitty is a stocking that features the cute Japanese character that’s loved all throughout the world. You get a personalized gift to give to your child or your other half. This model features the world’s most famous Japanese cat wearing an embroidered Santa hat as well as a red bow tie. Luckily, the kitty is also carrying a gift, so you won’t forget that you’ll also need to fill the stocking after offering it as a present. 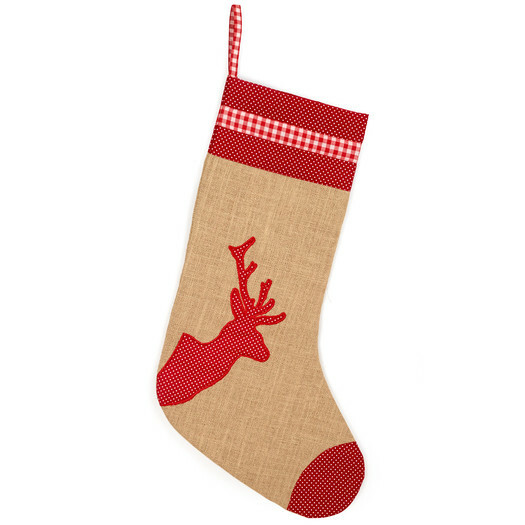 This stylish stocking is also durable, made of high-grade polyester. The sock measures 18.5 inches and can surely hold quite a few stuffings. Stockings are a genuine Christmas symbol that anyone likes and appreciates. Legend has it that Saint Nicholas puts gifts in them for boys and girls that have behaved well all year round. Being nice is mandatory if you want to find something inside the stocking. This tradition has expanded so much that nowadays you find cool Christmas stockings in department stores decorated with all sorts of accessories and sparkling colors. If you want this year to be memorable in terms of stockings and don’t know for sure how to grab a pair, there’s no need to despair because there are certain ways to impress Santa. There’s a variety of Christmas stockings on the market to choose from. All you have to do is make sure that the ones you will opt for are made from high-quality materials and reflect your personality. You can learn some tricks if you trust the second opinion of someone that has already been on this road and is aware of everything that can be known about the magical world of stockings. Keep calm because the perfect pair of stockings is out there, waiting for you. Believe or not, there’s an entire Christmas stockings market and each year new models come out which makes the decision to buy even harder. Nevertheless, there are plenty of options if you want to impress Santa and to fill your house with genuine holiday spirit. The best way to ensure that you get to have the Christmas stockings you adore is to make them with your own hands. It might sound a tad tricky, but in reality, the Internet is filled with tutorials and videos that teach you the exact procedure, step by step. You don’t need much because you can use any kind of fabric and some sewing tools. And of course, some spare time. Because it’s no contest, you can use whatever colors and accessories you want. If sewing is not your biggest talent, there’s always the option to buy simple stockings and change them as you desire. Use markers to draw names or letters and stickers if you want. You can use glue to stick other fabrics or glitter or to apply pockets. Let your imagination flow, and you’ll end up doing something fun and original. If you have kids get them involved, too. Buy everything you need and plan a nice session together. Call it the ‘Christmas Secret Stockings Project’ and give each one a task to fulfill. Don’t forget to bring cookies because it might take you some time wrap things up. Making stockings is fun, and you don’t need to spend much money because almost everything you need is provided by sewing tools. Stockings are meant to be put near the fireplace, but you can decorate your entire living room especially if you live in a small flat and don’t have a fireplace to hang them. Depending on your sense of style, you can either buy the same model of stockings for all your family members or let them choose the pattern they like most. If you plan on buying cool Christmas stockings for family and friends you should consider their size and color. Maybe you want pieces that are personalized with a certain name on the front or all in the same color. Larger stockings are preferable if you intend on putting candies or small gifts inside. Otherwise, if you’re only purchasing for the sake of the winter holidays, look for smaller ones that are cute and give a nice appearance on your Christmas tree. As far as the colors go, you can opt for red and white stockings, which is a classic color pattern or something with glitter if that’s your style. There’s no limit to the stockings you can place inside your home as long as you know that Santa will pay a visit for sure. With so many products available for sale, it’s hard to find cool stockings for Christmas that are original. Most of us lack time to search from store to store, and we rely on what we find in supermarkets. However, if you put in a little effort, you might be surprised to see that the budget for these holidays items can be substantially reduced if you know how to make smart shopping choices. There are many people that make stockings at home or have small tailoring studios where you can order ones made according to your specific instructions. You can place the order in a timely fashion and have them ready just in time to prepare your house for the holidays. Also, there’s another alternative such as going to winter fairs which are usually held around Christmas time. At a reasonable price, you’ll get awesome stockings that look better than the ones you pick up while doing the groceries. 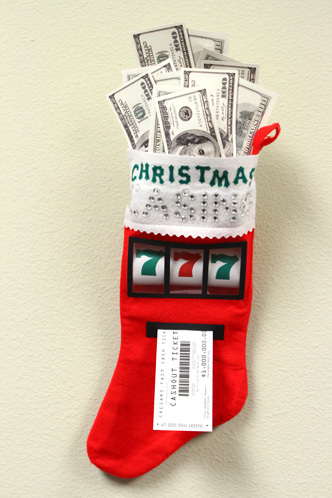 Besides color, Christmas stockings for sale come with design features that allow you to use them for a variety of purposes. If they are small, you can place them in glass bowls and decorate the table with them. Even add sugar canes in them and let your guest take care of their sugar cravings. You have endless possibilities to decorate the table or your windows and so on. Larger stockings are ideal for making pillows for the couch. All you have to do is fill them with soft fabric and put them on your bed or sofa. They’ll give a festive look to your living room or bedroom. Because not every home has a fireplace, there’s always the stocking Christmas tree, a useful invention that allows you to hang them on it. You can put as many stockings as you like and have two types of trees in your house. How cool is that! In a nutshell, stockings are versatile items that you can shop for in larger amounts because no one will get upset if you fill them with candy or oranges. They really do come in handy!